Watch the trailer below and consider a tax-deductible donation to help us finish this film! Each year, tens of millions of dogs are farmed or stolen, and then slaughtered for food throughout parts of Asia. In Korea, popular myth claims that a tortuous and painful death enhances the taste of the meat and the sexual "stamina" of the men who eat it. 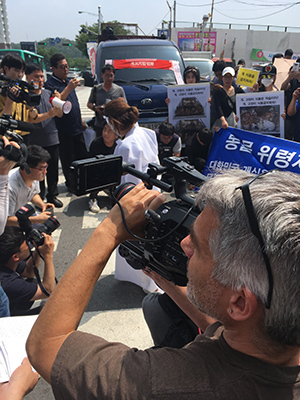 This increasingly stigmatized trade has become a flashpoint in South Korea, where some believe the Asian custom originated, and where cultural and generational shifts have drawn entrenched battle lines. Directed by Andy Abrahams Wilson, the filmmaker behind the Oscar semifinalist Under Our Skin, Dog War follows a team of unlikely American special ops vets as they join forces with Korean activists to stop the lucrative and powerful dog meat trade. Employing commando practices mostly undercover, they enter and disrupt this shadow world, saving one or hundreds of dogs at a time, and helping to transform an industry and country. Leaving behind families and critics that question their motives and tactics, they risk it all to fight for those that cannot fight for themselves. Dog War goes behind the scenes as the battle unfolds, looking at the complex forces that pit dogs' lives against human livelihood, and revealing haunting truths about the breach of contract with man's best friend. Great news! After three production trips to Korea, we have completed principal production, and now need funds to edit. We've already created a 10-minute sample clip and a 2-minute trailer (watch below). We've been fortunate to get this far with many small donations and a few larger ones, as well as in-kind services and reduced rate fees. With your help, we will be able to edit our roughly 80 hours of footage into a compelling narrative that will reach the hearts and minds of millions. Your tax-deductible contribution, large or small, brings us closer to finishing the film – and to mainstream visibility of this hidden horror. WANT TO GET CREDIT ON SCREEN OR AS A FILM PRODUCER? So that we can complete the film with the urgency it demands, we're looking for select donors who have the capacity and compassion to make a greater impact. For a $500 contribution, you will receive On Screen Credit in the completed film. We have other giving thresholds to receive honorary Associate Producer and Executive Producer credits. If you have questions about how this works or would like additional information, please email us directly. Open Eye Pictures is a non-profit, public benefit corporation under section 501(C)(3) IRS code. All contributions are tax-deductible to the extent of the law. Because it is a very important film project! Important to show what is happening to these dogs. Keep telling the truth ... it might lead to a better planet. This is so cruel, vile and barbaric there are no words to describe the insanity committed towards these innocent helpless dogs. Backwards dog spells god because they are God's creation. They are not meant to be slaughtered for human consumption. This is pure evil! The horror of the DCMT needs to be exposed as well as the way the China abuses and oppresses it's people and animals. As the so called intelligent species, we have a moral obligation to ensure all God’s creatures are treated with dignity, compassion and respect. Thank you on behalf of the dogs.